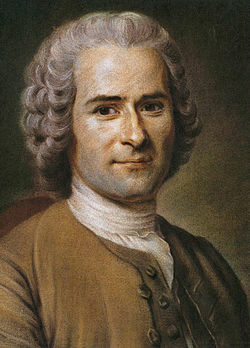 Jean-Jacques Rousseau was no friend of representative government. He was convinced that citizens are only politically free when they make the laws they themselves obey, in a pure democracy. Indeed, he was convinced that in a pure democracy the citizens would be well-informed and discuss the issues thoroughly. They would then vote and their decision would be the correct one. Anyone who was in the minority would then obey the will of the majority and in doing so, paradoxically, be “forced to be free.” Freedom, in Rousseau’s view, is defined as doing the right thing. Any form of representation, on the other hand, is a form of slavery, according to Rousseau. Citizens are putatively free for one brief moment when they vote, but after that moment has passed, they are slaves to the people they voted into office — those who would subsequently make the laws the voters would then have to obey. Rousseau, of course, never envisioned an age in which the airwaves would be filled with political campaigning, promises never to be fulfilled, and smiles that never seemed to leave the faces of the politicians who spent fortunes to be elected — not to mention the endless stream of phone calls and emails promoting the latest candidate who will assuredly “cut the pork” and “break the grid-lock in Washington.” He also never envisioned an age in which the candidates themselves would be chosen by a handful of wealthy men running giant corporations, thereby limiting the “freedom” of the voters even more. After all, how free are we when we don’t even chose the folks we are supposed to vote into office? But, then representation is itself a logical puzzle. Think about it. One person cannot possibly represent more than one other person — with whom he presumably agrees on every possible point of contention. Two or three, or two or three thousand people who are supposed to be “represented” by a single person, a paid politician, is a logical impossibility. And when that politician’s allegiance is to the wealthy few who have placed them on the ballot in the first place, then the notion of political freedom in a representative government begins to stretch beyond recognition. In a word, Rousseau’s notion that voters are free only when they actually vote (presuming that they bother to vote at all) raises problems in the world we have come to know — the world in which politicians are professional liars, for the most part, who are selected by a process over which we have no real control. We seem to have even less political freedom than Rousseau imagined, which was very little indeed. But why worry? I’ve got over two hundred channels on my television: now there’s real freedom! The stereotype of the old-fashioned schoolroom shows us the stern-faced teacher walking up and down the rigidly straight aisles with a ruler in her hand glowering at the children who were told not to speak in class or even to sneeze. If a child dared to make a noise and, say, whisper to the child next to her, the ruler would come down swiftly and the child would break into shrieks and later have nightmares about those terrible days. The idea was, it seems, to keep the kids in line, force-feed them knowledge — teach the kids the “three Rs” whether they wanted to learn or not. Following the lead of people like Jean Jacques Rousseau in France and later A.S. Neill in England, parents and teachers in this country began to realize that this model was somehow wrong and that the child matters. Theory started to shift toward what we now call “child-centered education.” The subject-matter began to be thought of as less important than the child who was being taught. Such notions as “authority” and “discipline” took on a pejorative meanings, calling up images of the ruler coming down on the knuckles of the small child by a teacher who suffered from Jehovah’s complex. Soon popular psychologists got on the bandwagon, thinking they could not only teach better than the teachers, but also raise children better than the parents. Parents and teachers were told not to “inhibit” the child, that “stern discipline” was not the way to go, that the child ought to be treated like an adult and allowed to find their own way. Teachers and parents were told to be their kids’ friends, not authority figures. Soon the “free schools” sprang up, patterned after Neill’s Summerhill school in England — where students were allowed to select their own subjects and study them when they were ready to, and not before. His system worked with many bright, precocious children, but in the majority of cases the children learned little and the experiment was called by many people, including Bertrand Russell, a failed experiment. But the child-oriented movement in this country had gained headway and began to take this country by storm. Supported by people like John Dewey (who later abandoned the theory, realizing that it had gone too far afield) and by the pop-psychologists who fell all over themselves rushing to get their books into print, parents and teachers questioned their own instincts and fell in line behind the so-called “experts” who may or may not have ever taught or even to have children of their own. They were not to restrict the children; they were there to support the child no matter what, always say “yes” and never say “no.” Thus was born the permissive society with which we are now so familiar where students are told they can walk on water even when it is not frozen and “authority” and “discipline” have become bad things — in the home as well as the classroom. Neill took a plain truth, namely, that students learn more quickly those things they enjoy — and developed it into a blatant falsehood, namely, that they will not learn those things they do not enjoy. In fact, students learn to like a great many things they might have avoided had they not been required to study them. Further, maturity is a function of being able to do those things we are not fond of doing, or which we have an aversion to doing. Child-oriented education has resulted in numberless children who are mis-educated and remain immature well into adulthood. While this might be seen as (a necessary?) swing of a pendulum away from the stereotype given at the outset of this discussion, the pendulum at present shows no signs of moving. There is little evidence that more than a handful of folks connected with education realize how damaging this theory has been to the education of our children — as evidenced by comparisons of the American school system with the likes of Finland. Take, for example, the current notion of discipline which is regarded as a bad thing, whereas, in fact, intellectual discipline involves the ability of a mind to follow an argument, form cogent arguments, perceive untruths and formulate responses to blatant falsehoods. In a word, discipline is essential to real thought. It does not require teachers patrolling the classrooms with rulers in hand. But it does require teachers who are acknowledged as legitimate authority figures and who are committed to teaching tough subjects and demanding positive results from their students. Above all else it requires teachers who demand that their students learn to read, write, speak their language, and calculate such things as the tip in a restaurant — things that increasing numbers of American students cannot do. The sort of thing that passes for thought in a classroom where discipline is thought to be a bad thing is merely disjointed, incoherent drivel. Flaubert said that discipline makes art of impulse. Similarly, discipline makes thought out of tangled, incoherent ideas and half-truths. Undisciplined thought is not real thought at all, it is mere impulse, gut feelings. And coming from kids who are, in many cases, overflowing with undeserved self-esteem, the way is paved for our mindless age of entitlement where spoiled kids cannot read, write coherently, or figure. But let us not simply assume that the pendulum will swing back somewhere just short of the teacher cruising the aisles with ruler in hand — say, to the vital notion of intellectual discipline instilled by demanding teachers who recognize and reward genuine excellence. It’s not going to happen unless enough people realize that the pendulum needs a push. And, sad to say, there appear to be very few around who even recognize the fact that the pendulum has become stuck in place. Thomas Hobbes imagined the state of nature to be a condition we were all in before the rise of political states. He described it as “solitary, poor, nasty, brutish, and short.” The basic emotion shared by all in the state of nature is fear. The purpose of political states is to keep us all in awe of the Sovereign and therefore at peace with one another. While other political theorists, such as John Locke and Jean-Jacques Rousseau borrowed the notion of a primitive state of humans prior to the formation of political states, none imagined the condition to be quite as unsettling as Hobbes did. For the most part, Hobbes’ notion was dismissed out of hand. But what about the relationship among nation-states themselves? Might it not be possible to make a case that nations are in a state of nature such as Hobbes describes with respect to one another, though not quite so bleak? Just consider the current disposition of nuclear weapons among the nations and think what their possession means to the various nations that possess them — and especially to those who do not possess them. Also, consider the fact that concern over the possibility that bellicose nations such as Iran seem on the brink of having such weapons has struck fear in the rest of the world — a fear that has driven other nations to express outrage. But, when you think about it, it may well be that the possession of nuclear weapons in large numbers is what keeps nations from one another’s throat. At least, that is a possibility, and our hope. But there is also the possibility that as nuclear weapons proliferate the likelihood that a nuclear exchange will take place increases. There are currently eight nations (possibly nine) with nuclear weapons in their possession — the United States leading the pack with 10,300 such weapons at last count (!). It is ironic that the nations that have yelled loudest at the thought that Iran might be in possession of nuclear weapons control the majority of such weapons worldwide. Ignoring the fact that this is the height of hypocrisy, concern is legitimate when a nation that has openly expressed its antipathy toward the rest of the world seems about to possess nuclear weapons. The defense that Iran, or any other country, is simply developing nuclear capacity for peaceful purposes is irrelevant, since 4 out of 6 countries with nuclear power capacity also have nuclear weapons. One seems to lead to the other. Another way of looking at this is to note that the six countries with the most nuclear power plants control 97% of all nuclear weapons worldwide. But whether or not the fact that a country has nuclear power leads invariably to the possession of nuclear weapons, the world is correct in wanting to reduce the number of nuclear weapons and resist the attempts by any more countries to get them. The mere possession of nuclear weapons in large numbers like those in the U.S. is morally indefensible. This is especially true when not long ago an American President was reportedly contemplating the use of “low yield” nuclear weapons as a first strike option in the Iraq war [Hint: Not the sitting President; his predecessor.]. It has generally been assumed that such weapons would only be regarded as deterrents to war, or at worst retaliatory, never as the first option in a war. The mere suggestion is marginally insane, as indeed is the buildup of such weaponry itself. In any event, it is reasonable to say that nations in our nuclear age exist in a state of nature in relation to one another. Thus, one might well follow Hobbes in suggesting that what the world needs is a Sovereign, a world government with punitive powers to keep the nations at bay. If any single nation ever seriously considers the use of such weapons as a first-strike option, the case for such a world government is all the stronger. Hobbes insisted that bellicose individuals needed a Sovereign they would fear more than they feared one another. As things now stand, the obvious choice to play this role is the United Nations, but at present, the United Nations is a toothless tiger. If we are to follow Hobbes’ lead, the tiger must be armed and fearsome and probably relocated in a neutral country. Perhaps this is what the world needs to get along in a nuclear age.